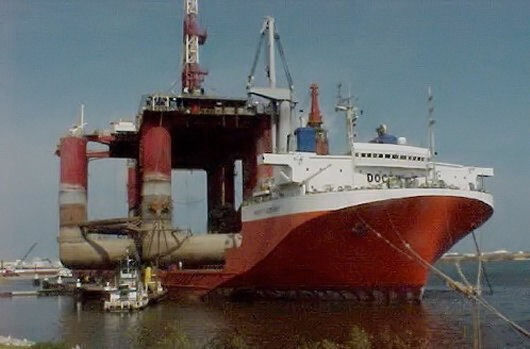 In October 2000, the semi-submersible drilling rig OCEAN BARONESS was dry transported from the US Gulf to Singapore by the heavy-lift ship MIGHTY SERANT 1. Because this was the first time a rig of this type (4 tubular floaters, 12 columns) was dry transported, a structural analysis of the rig was reviewed. An existing detailed StruCAD*3D model of the rig was modified and used to study the behavior of the structure when subjected to the design dynamic loadings of the transport. The FEM analysis showed that most beam and plate stresses were within the allowable limits, but beam seas headings should be avoided. ■ Define sea state limitations, as function of wave period and heading.